The Sargent 8204LN is a complete mortise lock which includes everything necessary for a new or replacement installation. Operates with storeroom function and provides maximum level of security and utmost efficiency. Sargent mortise locks are designed with very high standards in quality and durability. The Sargent 8204LW1 is a storeroom function complete mortise lockset that includes a lever with the design you select below and a LW1 decorative plate. This lock is ideally suited for office buildings, government facilities, hospitals, schools and universities. Greatly exceeds ANSI/BHMA Grade 1 cycle testing requirements. Sargent - 8205LN Office or Entry Function Complete Mortise Lock with Lever and Rose. The Sargent 8205LN is a mortise lockset which functions as an entrance or office lock. Sargent mortise locks are constructed with the highest standards of quality and safety. They greatly exceed ANSI/BHMA standards, are UL and UL listed to Canadian safety regulations for use on three hour doors and meet ADA requirements for barrier free accessibility. Sargent - 8205LNJ-26D Office or Entry Function Complete Mortise Lock with Lever and Rose. The Sargent 8255LW1 is a mortise lockset that can be locked and unlocked with the toggle on the outside lever. A key in the outside lever will retract the latchbolt and inside lever will retract latchbolt as well but will not unlock the outside lever. This lock function is generally used in office or entry applications. Sargent - 8255LN Office or Entry Function Complete Mortise Lock with Lever and Rose. The Sargent 8243LW1 is top of the line in strength and durability. Its quality construction is made to provide your doors with the ultimate level of security, and to ensure that your lock serves its purpose of protecting your home business etc., to the fullest extent possible, following the highest security standards. The 8243LW1 includes a lever and a decorative plate, and is programmed with the apartment/corridor function. This Sargent 8243LN complete mortise lock includes a lever (select style below) and an LN style rose. This lock is conveniently constructed to allow for simple re-handing without disassembling the components or removing the case. Lock also operates with only thirty degree rotation necessary to retract the latch. 8243LN operates with apartment/corridor function. This Sargent 8238LW1 is a Classroom Security Intruder Latchbolt Function complete mortise lock with lever and decorative plate. A key in either lever (on the inside or outside) will lock/unlock the outside lever and will retract the latchbolt. Outside lever will retract latchbolt, unless it is locked by key and the inside lever will always retract the latchbolt. This Sargent 8238LN mortise lock, is a 8200 series complete lock that operates with the classroom security intruder latchbolt function. This lock series is known to be the strongest lock on the block, providing you with maximum security, durability and performance. Greatly exceeds ANSI/ BHMA Grade 1 standards for cycle testing requirements. This Sargent 8225LW1 complete mortise lock with lever and decorative plate functions as a dormitory or exit lock. It can be ordered with a variety of different options such as product finish, different lever designs, choice of three different cylinders and the handing that will accommodate your door. Constructed for doors that are 1-3/4" thick. This Sargent 8225LNJ is an 8200 series complete mortise lock that is equipped with J style lever and an LN style rose that has a diameter of two inches. Designed to suit your needs for a dormitory or exit function lock with many options to choose from below. Requires only thirty degrees or lever rotation in order to retract the latch. Sargent - 8225LN Dormitory or Exit Function Complete Mortise Lock with Lever and Rose. This Sargent 8225LN is an 8200 series complete mortise lock that is equipped with a B, L or P style lever and an LN style rose that has a diameter of two inches. Designed to suit your needs for a dormitory or exit function lock with many options to choose from below. Requires only thirty degrees or lever rotation in order to retract the latch. This Sargent 8237LW1 is a fantastic classroom function mortise lock that is suitable for many classroom settings with a key on the outside that locks and unlocks the outside lever and retracts the latchbolt. Outside lever retracts latchbolt unless it is locked by key, and the inside lever is always free to retract the latchbolt. Sargent - 8237LN Classroom Function Complete Mortise Lock with Lever and Rose. This Sargent 8265LW1 is a mortise lock package supplied with a lever and an LW1 style decorative plate. This lock is used for privacy function applications. Its outside lever will retract the latchbolt unless it is locked by the thumbturn on the inside. The inside lever will always retract the latchbolt and unlock the outside lever. Thumbturn on the inside locks and unlocks the outside lever.Closing the door will unlock the outside lever. An emergency release will release the outside knob. Sargent - 8265LN Privacy Function Complete Mortise Lock with Lever and Rose. This Sargent 8265LN mortise lockset includes a lever and an LN style rose that has a diameter of two inches. Operates with the privacy function (ANSI F22) for applications in hospitals, schools, universities, office buildings or government facilities where privacy is necessary. Designed with the highest quality structure and durability standards to ensure excellent lock performance and customer satisfaction. Sargent - 8215LN Passage Function Complete Mortise Lock with Lever and Rose. This Sargent 8215LN is a complete mortise lockset in which both, the inside and outside levers are always free and will always retract the latchbolt. It is available with various lever designs with the LN style rose. Select below the product finish that suits your taste, and the handing of your door to ensure proper installation. This Sargent 8215LW1 commercial mortise lockset is designed so that the inside and outside levers will retract the latchbolt at all times. The 8200 series Sargent locks exceed ANSI/BHMA Grade 1 cycle test requirements by 14 times and are Security Grade 1 certified by ANSI/BHMA 156.13 series 1000 operational Grade 1. They also meet ADA requirements for barrier free accessibility. This Sargent 8271LN fail secure, electromechanical mortise lock is designed to handle single opening, stand alone applications or can be readily integrated into sophisticated access control systems. This Sargent 8270LW1 mortise lock package includes a B, L, or P style lever and an LW1 style decorative plate. Various finishes, cylinders, and voltage options are available to customize your lock to the specific needs of the application. This electromechanical lock satisfies industry standards for operating temperature, shock and fire hazard. Exit function complete mortise lock. This Sargent 8270LN complete electromechanical mortise lock is constructed with the highest standards of strength and durability for commercial, heavy duty applications. Its Fail Safe feature will ensure that the door remains unlocked in the event of a power loss. Key in the outside will retract the latchbolt unless the outside lever is locked with the solenoid. The lever on the inside remains free at all times. This Sargent 8271LW1 is a complete electromechanical mortise lockset that is furnished with a lever and a decorative plate. It is designed with the fail secure security feature which will ensure that the door will remain locked in the event of a power loss. This lock is made to work well with single opening, stand alone doors or it can be simply integrated into a sophisticated access control system. This Sargent 8204 mortise lock body is a storeroom function lock that is always locked from the outside (re-locks when the key is removed from the cylinder). Inside lever is always free for exit. This package includes an outside front, a strike and mounting screws. Cylinders, levers and roses are not included. This Sargent 8205 Entrance/Office function heavy duty mortise lock body includes an outside front, strike and mounting screws. Package does not include cylinders, levers or roses. This lock body requires a 1-1/8" mortise cylinder which is not included in the package. This product is handed and field reversible, and is generally shipped as right handed. This Sargent 8215 is a passage function mortise lock body where the inside and outside levers are always free for entry or exit. Lock body measures 4-3/32" in depth and 5-31/32" in height. Fits on doors with a standard backset of 2-3/4" and standard thickness of 1-3/4". 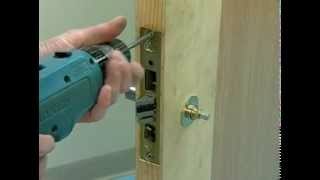 Door stile must be at least 4-1/2" for a regular lock and a minimum of 4-3/4" for electrical function locks. This Sargent 8237 mortise lock body package includes an outside front a 4-7/8" curved lip strike with a standard curved lip of 1-1/4" (non-handed) and mounting screws. Cylinders, levers and roses are not included in this lock body package. This lock operates with the classroom function in which a key in the outside lever retracts the latchbolt and locks and unlocks the outside lever. The outside lever will retract the latchbolt unless it is locked by key. The inside lever is always free. This Sargent 8243 mortise lock body is for commercial heavy duty applications such as in hospitals, government facilities, schools, universities and office buildings where apartment/corridor function is necessary. This product is handed and easily field reversible. It is generally shipped as right handed and can be easily re-handed without disassembling the components or removing the case. This Sargent 8255 is a mortise lock body package that includes the outside front the curved lip strike and mounting screws but does not include the trim or the cylinder (requires 1-1/8" mortise cylinder). Only a thirty degrees rotation of lever is necessary in order to retract the latchbolt to make operation as simple as possible. This Sargent 8265 mortise lock body is designed for privacy, bedroom or bath applications in commercial heavy duty areas. Outside lever will retract the latchbolt unless it is locked by the thumbturn on the inside. Inside lever will retract the latchbolt and unlock the outside lever. Thumbturn will lock/unlock the outside lever and closing the door will unlock the outside lever as well. 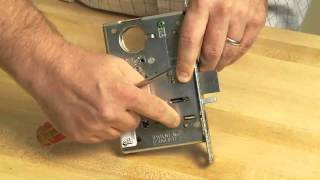 This Sargent 8271 is an electromechanical fail secure function mortise lock body that is designed to keep a door locked in case of power loss. As part of the 8200 Sargent lock series, it is a strong and durable lock, perfect for heavy duty applications in commercial areas such as hospitals, schools and universities. This Sargent TR8204-LNL is a trim pack that consist of an LN style rose and an L style lever. This trim set can be used in conjunction with the following functions: 8204, which is the storeroom function, 8205, the entrance/office function, 8237 is the classroom function and 8255, the office/entry function. This Sargent TR8215-LNL is a rose and lever trim set. Complete mortise locks are available with many different trims designed to work with specific functions. This TR8215-LNL trim set is for the passage function. This Sargent TR8224-LNL is a storeroom with deadbolt function, dormitory/exit function, apartment corridor function and dormitory function trim set. Package will include an LN style rose and an L style lever as well as spindles, trim pack assemblies, instruction sheets and templates. This Sargent TR8204-LNJ is a trim set used for 8204 - storeroom function, 8205 - entrance/office function, 8237 - classroom function, and 8255 - office/entry function. Complete set includes LN rose and J lever design, spindles, trim pack assemblies, instruction sheets and templates. This Sargent TR8215-LNJ trim set includes an LN rose and a J lever. It is available in various finishes and it is designed to work with passage function locks (8215). This Sargent TR8265-LNJ is for privacy function locks.The style is J lever and LN rose. This trim set includes spindles, trim pack assemblies, instruction sheets and templates, but lock body and front are not included in this package. This Sargent TR8204-LNB is a storeroom, entrance/office, classroom, and office/entry function trim set. Consists of LN rose and B style lever. Choose from polished brass (605), satin bronze (612), oil-rubbed bronze (613), polished chrome (625), and satin chrome (626) finishes. This Sargent TR8215-LNB passage function trim set is for locks that allow entry and exit at all times from the inside and the outside. Select a finish that suits your taste below or contact us directly to order a finish that is not shown. This Sargent TR8224-LNB is a trim set for storeroom with deadbolt function, dormitory/exit function, apartment corridor function and dormitory function locks. Package consists of an LN style rose and a B style lever as well as spindles, trim pack assemblies, instruction sheets and templates. This Sargent TR8265-LNB, LN rose and B lever trim pack is available in the polished brass, satin bronze, oil-rubbed bronze, polished chrome, and satin chrome finishes. A complete package will includes a rose, lever spindles, trim pack assemblies, instruction sheets and templates. This Sargent TR8204-LNP is for storeroom function locks, entrance/office function locks, classroom function locks or office/ entry function locks. Select the finish of your choice below or contact us to place a special order. This Sargent TR8224-LNP is a trim set for 8224/8225/8243 and 8245 function locks. It is available in various finishes which can be selected below. This Sargent TR8265-LNP, complete trim set includes an LN style rose, a P style lever, instruction sheets, templates, spindles and trim pack assemblies. A lock body and front have to be ordered separately if needed. It is used for privacy function locks. This Sargent TR8224-LW1 is a handed escutcheon and lever trim set for locks that operate with either of the following lock functions; Storeroom with deadbolt, dormitory/exit, apartment/corridor or dormitory. Available with the B, L, J, or P style lever and with various finishes. This Sargent 82-0080 is a 1-1/4" standard width, outside front plate used to cover the exposed front of a 8200 mortise lock body. Works with passage and privacy function locks. This Sargent 82-0083 outside front plate is a standard width (1-1/4") cover plate used to protect and cover the exposed front of 8200 mortise lock bodies. This Sargent 82-0084 outside front plate is used to cover the front of Sargent 8200 mortise locks. It measures 1-1/4" in width. Available in various finishes to match the finish of your lock. This Sargent 82-0085 is the standard outside front plate that is used to cover the exposed front part of Sargent 8200 mortise lock bodies. Designed for office/entry function locks (55). This Sargent 82-0086 is an outside front plate required to cover the exposed front of an 8200 mortise lock body after installation. Can be used with 45/46/47 and 48 function locks. This Sargent 82-0087 outside front plate is available in five different finishes to match the finish of your lock. The width of the plate is 1-1/4" and it is used with locks that operate with function 43. This is a Sargent 82-0578 outside front plate for electromechanical function locks (70/71/72 or 73). Standard width is 1-1/4". This Sargent 579-2 spindle kit is for use with Sargent 8100 mortise locks on 1-3/4" thick doors. This Sargent 578-2 is a spindle kit is for use with Sargent 8100 mortise locks on 1-3/4" thick doors. This Sargent 78-0034 is a deadbolt strike without a lip that is the standard used with Sargent 8200 mortise locks. The deadbolt engages the strike when the door is closed, thereby securing the door to the frame. This Sargent 82-0081 outside front plate measures 1-1/4" (standard width) and is used to cover the exposed front of Sargent 8200 mortise lock bodies.